Complex to be on campus of historic buildings in long-neglected part of D.C.
WASHINGTON (CNN) -- Washington notables broke ground on the future home of the Department of Homeland Security on Wednesday, symbolically starting construction on the biggest federal building project in the Washington area since the Pentagon 68 years ago. Rendering of future Coast Guard headquarters, with green roof designed to capture and reuse water. Department leaders hope the $3.4 billion consolidation will help the department fulfill its core mission -- protecting the homeland -- in ways big and small. "It will help us hold meetings," Secretary Janet Napolitano said. "It will help us build that culture of 'One DHS.'" At the groundbreaking, political leaders shoveled dirt with care, but pitched historical references and metaphors with abandon. "I do have a kind of paternalistic feeling towards DHS," said Sen. Joe Lieberman, I-Connecticut, an early advocate for creating the department. "I feel like we've finally given a home to this child we've created, which is finally reaching maturity." Lieberman likened the creation of the department's headquarters to the creation of the Pentagon. Ground was broken on the Pentagon on September 11, 1941, exactly 60 years before the 2001 terrorist attacks, he noted. President Franklin Roosevelt planned the defense consolidation, Lieberman said, because he knew war was imminent and felt it could be coordinated more efficiently from one location. The Department of Homeland Security also will benefit by consolidation, Lieberman said. The site today has the appearance of a sprawling college campus -- although one stuck in time. Established by Congress in 1855 as the Government Hospital for the Insane and later renamed St. Elizabeths, the campus has 62 buildings built between the 1850s and 1940. The federal government plans to preserve 52 of the historic buildings, which are in varying stages of decay. Of the 10 buildings to be destroyed, eight are greenhouses that have major structural damage. Some $650 million in Department of Homeland Security and General Services Administration federal stimulus money is expediting some of the rehabilitation, the latter agency said. The project also includes large amounts of new construction. The first building, a 1.8 million-square-foot U.S. Coast Guard headquarters, will cost about $435 million and is scheduled for completion in 2013. The building will include "green roofs" and landscaped courtyards to capture and reuse surface water. Former Homeland Security Adviser Fran Townsend said the department is right to consolidate its facilities but cautioned it won't make the huge differences some people claim it will. 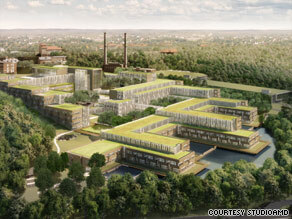 "For one thing, what we know is St. Elizabeths is not big enough to hold all of their headquarters components," she said. And while the department needs to be far enough away from downtown Washington to survive an attack, it "suffers from not having a presence on the National Mall just like all the other major agencies," she said. City officials were ebullient Wednesday about the prospect of a blighted area being transformed. The gated campus borders some of Washington's most violent streets. "They're going to try us, and they're going to like us," said Eleanor Holmes Norton, the District of Columbia's delegate to Congress. Councilman Marion Barry, who has long complained the area is ignored by the federal government, tweaked visitors at the groundbreaking. "I hope most of you had your GPS's working," he said.